So, I am standing in line at Trader Joe’s. As usual, my quick trip yielded a cart and a half of food, water and wine. I think maybe their carts are too small. Anyways, I am making small talk with one cashier, when another one walks up and starts chatting and bagging my groceries. The piped-in store music had Pat Benatar’s Love is a Battlefield playing, and of course, a few hours later, it is still on loop in my head. Yes, I am a blessed woman, because we rarely get into a battle about petty things. Maybe 34 years of marriage will do that. But I was totally serious about the remote. I don’t watch much TV, so that battle isn’t truly a battle. 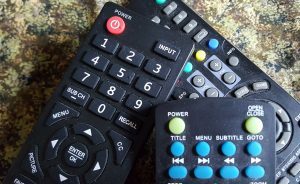 Maybe it’s a guy thing, but my dear husband insists the remote “has the power.” I do like to grab it from him time-to-time and claim, very boldly and loud – of course – that, “I have the power!” while waving the remote in the air. For the first 32 years of marriage, even while stationed in Hawaii, I was always freezing. Well, maybe I am exaggerating. Maybe not freezing. But for sure, most of our marriage I’ve been in sweaters, pushing the thermostat up, up, up, and sleeping under 18 inches of blankets. However, the last two years, I have been living my own personal summer. Hot flashes are for real. I dress in layers to discreetly peel off my clothes without embarrassing the family. Or blinding innocent bystanders. These days, if a restaurant is too crowded or hot, I am not one to stay. When the option to eat outdoors is available, guess where we sit. Ask anyone – they will verify this. In fact, I’d be happy to push the snow off the patio furniture in January and dine al fresco. I can totally see me running the air conditioning in the dead of winter. I never thought I’d appreciate the fact that I’m running like a blasting furnace most of the time. But instead of being too upset, it dawned on me that it could be great for our marriage! My spouse had to deal with the house being too hot for his liking for years. Now we can appreciate lower temperatures and zero complaints. It will be pure bliss. I, being comfortable with the internal temperature, saw him nudge the thermostat up to 68 degrees. It was then I had an ah-ha moment. My dear spouse spent almost a year deployed in the desert, living with 120-plus degree temperatures. It was what he was used to. Poor guy hasn’t dealt with fall or winter in over a year. So, naturally, he’s going to feel the cool, damp, autumn air like it’s an arctic blast. Me, I am welcoming it with open arms. My vision of our midlife couple-ness having a mutual love for cooler temperatures – after all these years – went out the proverbial window – which I still have open a crack. Ah, love is a battlefield. So here I am, choosing my battles. He is welcome to the remote. I won’t need it – not this winter anyway. Chances are I’ll be sitting on a block of ice in an igloo in our backyard. With an ice cube in my wine. And a fan. I will envision palm trees swaying as I enjoy endure in my own tropical paradise. Are temperature wars happening in your home? Do share in the comment section! If you find humor in the midlife battlefield, feel free to share this – social media share buttons are below. Sign-up for direct email of my latest posts and rants using the link to the right. I, like you, was always cold and Rick was always warm. Our roles have reversed and I am always hot and he is always cold. I can relate to this story very well. Please tell me there is some hope… or balance!! Interesting posting, Lynne. It’s also very real and truthful. I think the remote battle is the easiest one to conquer. The thermostat is another story. I believe this battle will go on until eternity, as long as men and women are “wired” the way they are. We try to compromise the best we can! I think the gals have the upper hand, though. (lol). Lol… a bike pump up your backside! So Pam, there is hope?! Thank you! Oh yes! I’m always the cold one and hubby and I will secretly adjust it when the others not looking. Although I always win because I use the baby as an excuse.